The HP-IB (HP Interface Bus) was introduced by HP in 1972 to provide a standardised means of remote control and monitoring of test and measurement equiment. Other manufacturers copied this and called it GPIB (General Purpose Interface Bus). In 1975 the IEEE 488 Standard was introduced. The IEEE (Institute of Electrical and Electronic Engineering) and the IEC (International Electrotechnical Commission) which is responsible for worldwide standards have formalised the HP-IB as IEEE 488.1 or IEC 60625.1 which define the physical layer. IEEE 488.2 or IEC 60625.2 introduces a 'Command' language. The Bus is made up of 16 signal lines and 8 ground lines. There are: 8 data lines D1-D8; 3 handshake lines DAV DAta Valid, NRFD Not Ready For Data, NDAC Not Data ACcepted; 5 management lines ATN ATteNtion, EOI End Or Identify, IFC InterFace Clear, REN Remote ENable, SRQ Service ReQuest. 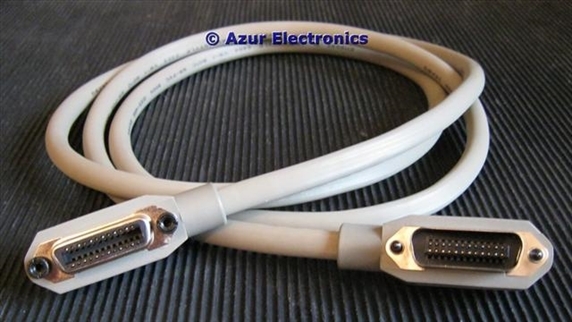 A 24 way Amphenol / Centronics style connector is used, with the equipment having a socket, and unusually the cable having a mating plug but with another socket piggy-backed behind it. This allows the cables to be daisy-chained. The black thumb screws indicate a metric thread M3.5, older versions use a plain UTS thumb screw. Up to 16 items of equipment can be connected to the Bus. This includes the 'Controller' usually a PC and up to 15 'Devices' usually the test and measurement equipment. Each Device has a unique 5-bit address in the range 0 to 30. This gives a maximum of 31 unique addresses, as by using a 'Bus Extender' it is possible to have up to 31 Devices on the Bus. The 8-bit bi-directional parallel data lines have a maximum transfer rate of 1MByte/s. This limits the cable length to 2m between equipment with a maximum overall length of 20m. The 3 handshake lines ensure that each data byte is received and acknowledged. ATN allows the Controller to differentiate between data and control signals. EOI is to indicate data transfer completion. IFC provides a reset function. REN allows the Controller to operate the Device by disabling its front panel controls. SRQ notifies the Controller that a Device needs servicing. Initially the software command language was device dependant. For instance the HP 3488A Switch Control Unit uses commands such as close 103, 206 or recall 25. In 1990 HP introduced the TML (Test Measurement Language) which became an open standard as SCPI (Standard Commands for Programmable Instruments). For instance the Agilent 3499A Switch Control System uses SCPI commands such as ROUT:CLOS (@103, 206). A lot of my test and measurement equipment has the HP-IB fitted as standard or as an option. So far I have not had any need to remote control any equipment or automate measurements. These are far more complicated! Although microprocessors are widely used in test and measurement equipment, the Controller is the interface to computer technology. This involves PCs, Operating Systems, I/O Interfaces, Drivers, Application Software, etc. There are a variety of Controllers available from PC Cards, USB and Ethernet interfaces. National Instruments seems to be the market leader in this field, see http://www.ni.com/instrumentcontrol/ for information.